He did it: He's certainly not dead yet and proved that you can say goodbye plenty of times. Remember: He has quit touring in 2005 (solo) and 2007 (Genesis). Phil Collins kicked off his comeback tour yesterday evening in Liverpool. 10,000 fans attended the sold out show in Liverpool's Echo Arena. It was his very first solo gig in Liverpool and the first one since Genesis played there in 1980. Interesting: Since the No Jacket Required tour, Phil has not started any of his tours in the UK. On 1st July 2010, Phil played his last full show in Montreux (Motown showcase). There are a couple of things to be discussed. Like on his previous tours, the last song to be played from tape / hard disc before the band comes on stage is once more Souareba by Salif Keita. 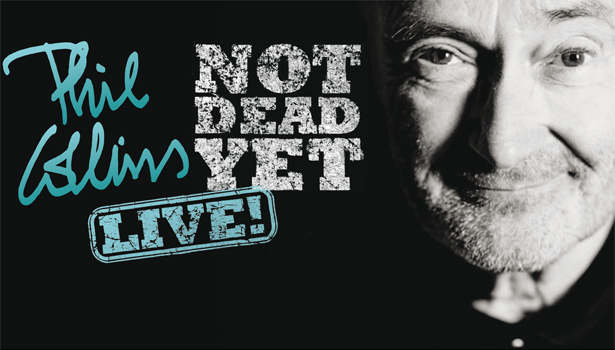 Phil Collins started the set with Against All Odds, then Another Day In Paradise and One More Night. Three of his biggest hits ever. After that he plays Wake Up Call, a track that has only been performed once during a TV promotion for Testify. Interesting how Wake Up Call gains power with proper instruments. Wake Up Call is followed by Follow You Follow Me by Genesis - Phil has never played this track in his own set. Can't Turn Back The Years was played during the Dance Into The Light-Tour 1997, so it has been 20 years for that track. Only You Know And I Know is not one of the usual suspects, it is in fact a live comeback after 22 years. He played that one during the Both Sides / Far Sides tour. The same applies to I Don't Care Anymore. As an intro to that song, Nic Collins played a little drum solo. Very surprisingly, Phil performed You Know What I Mean, which was last performed occasionally during the first shows of the Trip Into The Light tour (North American leg). Nic plays piano on that song. After a couple of well known up-tempo songs, the main set ended with the usual suspect Sussudio, which also means he didn't play long time favorites such as Don't Lose My Number, Two Hearts or Wear My Hat. The first encore was a real suprise. It's a cover of Édith Piaf's Hymne à L'Amour / If You Love Me (Really Love Me). The final track was, as usual, Take Me Home. A couple of weeks ago, a rehearsal setlist was discussed among fans. Some of the tracks he rehearsed weren't played: Turn It On Again (would have been the third Genesis song) and Going Back. We will see whether or not these tracks will appear (among others) during the shows to come. The stage looks quite simple, but offers some interesting screen and lighting effects. Phil performed the whole show seated and didn't play any drums not even during In The Air Tonight (as some have expected). The show consisted of two parts separated by an intermission. Towards the end of the show Phil stated: "I was dubious about doing any of this again, seriously, but tonight you've helped restore my faith in my ability. You really have." The tour will continue this Sunday with 5 shows at London's Royal Albert Hall.